Here's the link to my Spill the Beans coffee column in yesterday's HTR. 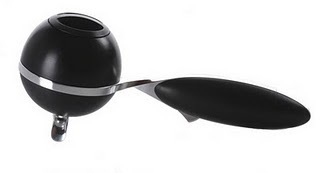 The article is about a cool new espresso gadget called the Mypressi TWIST. I need to point out an important error in the edited version (or more properly, altered version) of the article that went to print. In the article I submitted I had written the second sentence to read "Unfortunately, the price of a quality machine forces many more people to assign such units wish list-only status." I also ended the article with "The Mypressi TWIST offers excellent value at its $170 price tag." In the published version of the article the staff, for whatever reason, combined the two sentences so that the second sentence erroneously reads "Unfortunately, the $170 price tag of a quality machine forces many more people to assign such units wish list-only status." Quality counter-top espresso machines do not cost $170. They are quite a bit more expensive than that. The intention with the original last sentence was, of course, to make it clear that the $170 cost of the Mypressi TWIST is a very good value and well under the cost of a good counter-top machine.